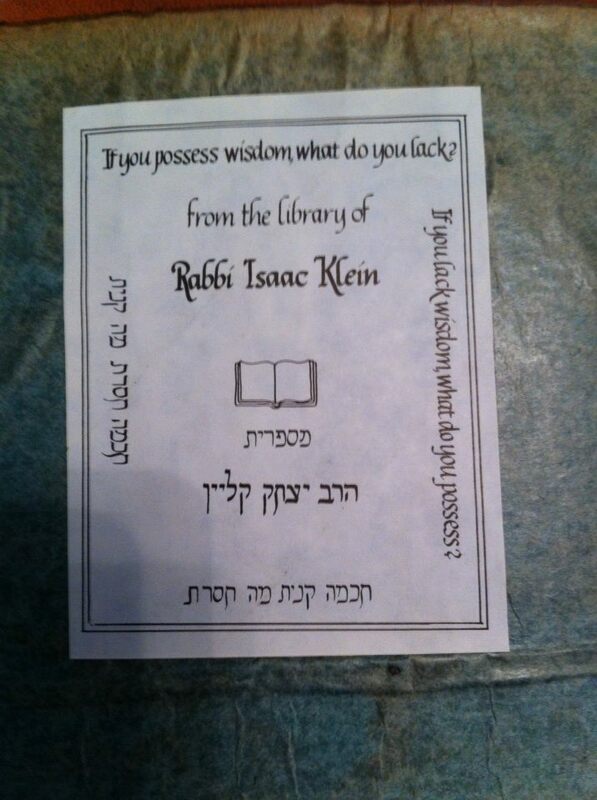 My dear grandfather Rabbi Isaac Klein had accumulated a library of over 10,000 books by the time he passed away. Most of those books were donated to libraries. You might ask, ten thousand books? He must have been a wealthy man. But let me tell you, he was wealthy in wisdom, in kindness, in piety and in generosity but not in money. The family suffered through periods of severe poverty but they never felt poor. As my grandmother would say, there were times where there was hardly enough money for food but there was always money for books. You see to my grandfather books were life. There was no life without the precious books. He studied everything, of course the Torah, the Talmud, he himself authored a dozen books on these topics. But he also studied psychology, Roman law, history. He could never be seen without a book. To him the greatest gift he could give was a precious prized volume. On his books he wrote, "If you possess wisdom what do you lack, if you lack wisdom what do you possess?" My grandfather did not have much money but yet he could always afford books. It is not only a matter of priorities, it is the value you associate with an item or a service. Is ten dollars a lot of money? Ten dollars is a great deal of money for a pack of chewing gum but a very small amount of money for a car. I doubt there is anyone who would turn down an offer to buy a car for ten dollars. For my grandfather books were of such supreme value, as they contained the most precious of all, knowledge and wisdom, that no matter how poor the family was he managed to find the money, even if it meant going hungry. I do not recall him going to clubs or restaurants. On the other hand there are those that no matter how little money they have you will find them at the bar/pub on a Saturday night. Attached value. It is simply a matter of the value you attach to the item or service. When I was looking for a Karate school to join back in the 1980s there was a line that sold me on the school that I choose. Sensei Romero said, "Our students pay their dojo fees before they pay their rent." I knew this was the right place for me. Attached value. If your martial arts training is a hobby, an activity with no great value, well, you will not find the $150 to pay for it. There will always be something more pressing; a dinner out with the family, a cup of Starbucks coffee, whatever. Other than truly dire situations, (health issues, unemployment etc) we can always find a few dollars for the things we truly value. I have seen it time and time again. I have heard cries of poverty but then I see the same people enjoying an ice cream Sunday. No one needs an ice-cream Sunday. I have seen men so poor they had not bought a new suit in years, but they always had some money to give to those poorer than themselves. For them giving charity to the poor had great value. If you have no money to pay for something you have to ask yourself; Do I really value this service, this product? When it comes to Krav Maga training/membership/products, what value do you really attach to it? Is this a matter of the utmost importance? Is this a matter of preserving the life and happiness of you and your family? If you have no money for such training then, barring extreme circumstances, it probably does not really have such great value in your eyes. If you cannot afford to train with your instructor, to put out the time and money, than it probably means that you do not attach great value to his service. And I remember my dear sweet grandfather, always with a book or two, or three. If you possess wisdom what do you lack? If you lack wisdom, what do you possess? A gift from my late grandfather; truly a prized possession. A rare volume that survived the destruction of our people. 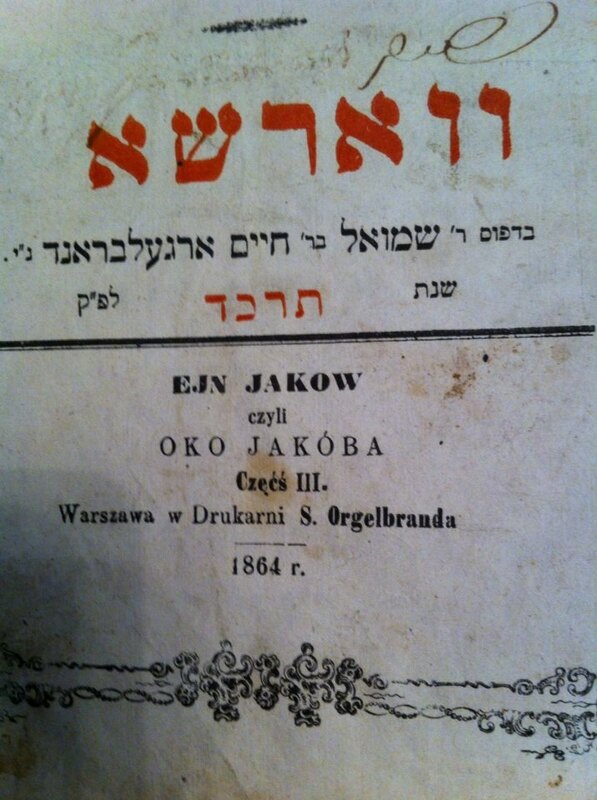 The Ein Yaakov, or Ejn Jakow in Polish, published in Warsaw 1864.